In the 5th century BCE, the contacts between India and Greece became sporadic. The reason for this was the defeat of the Persian army in two wars. In 490 BCE, the Persian army, which included Indian cavalry, was defeated by the Athenians at the Battle of Marathon. The Persians were also defeated in 480 BCE at the Battle of Plataea which followed the Battle of Thermopylae (remember 300?). Since the relation between the Persians and Greeks broke down, it in turn affected the Indo-Greek relations. That said, there is evidence that Indian ascetics traveled to Greece along a trade route that went through Oxus river, Caspian Sea, Kyros river and Black Sea. These ascetics influenced Diogenes of Sinope (412 – 323 BCE) who then introduced Indian ascetic practices into Greek traditions. But much before Diogenes, there is a mention of an Indian yogi who met Socrates and had a conversation. 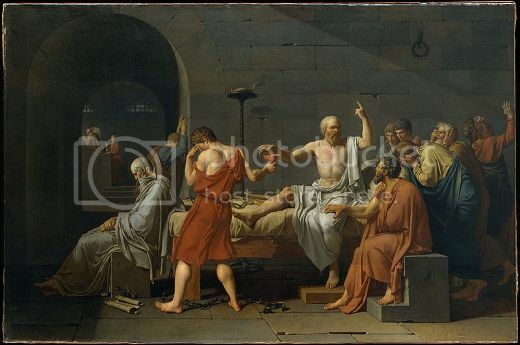 It is not sure if Socrates changed his mind, but his student Plato was influenced. Plato who previously argued that human and divine affairs were the same, started distinguishing between the two. According to Plato there was one kind of study concerning nature, another concerning humans and a third concerning dialectic. Unfortunately, we don’t know the name of this Indian teacher and to what tradition he belongs to or any other detail. Mcevilley, Thomas C. The Shape of Ancient Thought: Comparative Studies in Greek and Indian Philosophies. 1st ed. Allworth Press, 2001. Caesarea, Eusebius of. Eusebius of Caesarea: Praeparatio Evangelica, 2010.